Have you ever been driving past STORExpress Etna and noticed the business connected to the side of our building? If you were wondering what that is, it’s Mad Science. They teach the fundamentals of science to thousands of children through their fun and interactive programs. While Mad Science is a franchise with multiple locations all around the world, their lab at STORExpress Etna is the only one in Pittsburgh. Although they are a smaller company, they use it to their advantage by creating close connections with kids and families. Mad Science’s small staff (aka scientists) each have their own specific roles, skill sets and unique personalities that all come out when working with kids. They view their work as play and love that they get to learn right along with the kids they teach. All Mad Science employees have backgrounds in science and education and are dedicated to encouraging scientific literacy in children. Will Cody first started running Mad Science from his garage in Aspinwall. At first, he was a one man show planning only birthday parties and he relied solely on word of mouth for his business to grow. He soon outgrew his garage and around eight years ago, moved the business into one of STORExpress’ office spaces along with a few employees. Having more space allowed him to add more programs and employees, but he soon found he needed more room. He again turned to STORExpress, and moved Mad Science into a large office suite on the side of STORExpress Etna. 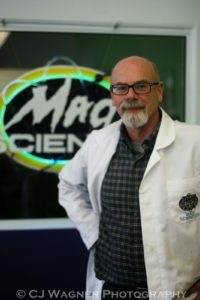 Having the extra space has allowed Mad Science to grow their business as they can now accommodate more kids. Mad Science delivers innovative, entertaining and hands-on science themed events for children. They host birthday parties, community events, after-school programs, preschool programs, summer camps and workshops. Their scientists will be glad to come to you and set up shop at your event, or you and your party can come to them at their Mad Science Lab in Etna. Mad Science will also work with you to customize birthday parties based off your child’s age and interests. Although they do many birthday parties, Mad Science also puts on several other types of events for schools, libraries and daycares. They have recently hosted events in conjunction with the Salvation Army, the Butler Fair, and Bayer. Their personable and hands-on experiments spark an interest in science in kids ages three to twelve. Even though most of their business comes from children and tweens, older teenagers also enjoy their events. Recently, Mad Science hosted a high school graduation party in their lab! The company uses being small and homegrown to their advantage by being interactive and getting to know the families. Their camps and after-school programs are limited to classroom sizes of 25 children to make sure they can provide an amazing experience for all. Their summer camps range from 1 to 12 weeks so no matter how busy your summer is, there’s a Mad Science camp to fit your schedule. If you want to schedule an event with Mad Science call 412-779-0123, but make sure to act fast! They have 25 birthday parties planned for September and their schedules fill up quickly. 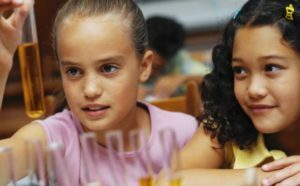 Their after-school programs and camps are also limited to 25 kids so plan in advance to ensure your child’s spot and be on the lookout for their programs for next summer! Want to try out a fun science experiment for your child at home? This Topsy Turvy Twister will only take you 60 seconds to do! Fill one bottle about ¾ full with water. Add 10 drops of food coloring and a sprinkle of glitter (this is optional). Place the washer over the mouth of the bottle. Then place the second bottle upside down on top of the washer (mouths together). Wrap duct tape firmly around the necks of both bottle mouths. Press the duct tape into the neck of the bottle to stop leaks from forming. Carefully flip the bottles over so that the water-filled bottle is on top. Place them on a flat surface. Hold the top bottle and swirl it in a circle. What happens to the water as it leaves the top bottle? Look at the water near the center of the bottle. What do you see? Flip the bottles and swirl the top bottle faster and then try again slower. What happens? You made a tornado vortex! A vortex is the swirling funnel shape inside a tornado. This shape forms when cold, dry air mixes with warm, moist air. This combination creates a big wind resulting in thick, black thunderclouds. The warm air moves in an upward spiral. Gusts of water vapor follow the air. The tornado’s twisting, funnel-shaped cloud forms when the air cools. In your model tornado, gravity pulls the water vortex down.